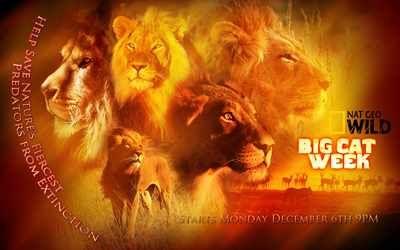 November 28-December 5, 2014 is Nat Geo WILD's Big Cat Week. Its a week totally dedicated to the world's big cats- lions, tigers, cheetahs, panthers, etc. These beautiful and powerful creatures are rapidly facing extinction. Big Cat Week provides stunning and powerful stories from around the world, and allows viewers to share in the triumphs, defeats, and struggles of our planet's big cats.